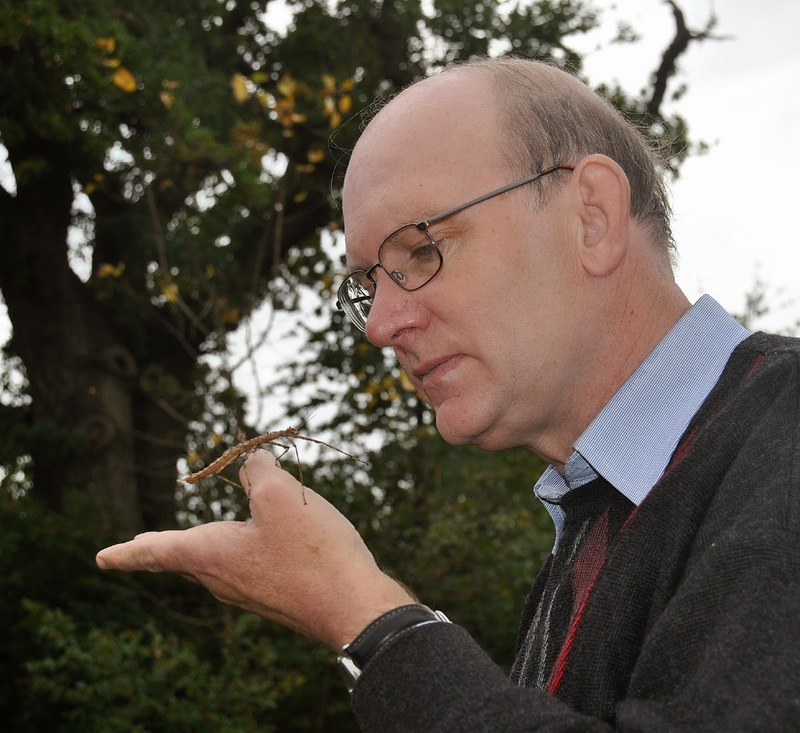 Paul D. Brock, Author, Natural History Museum, London, and from home in Brockenhurst, Hampshire, UK. 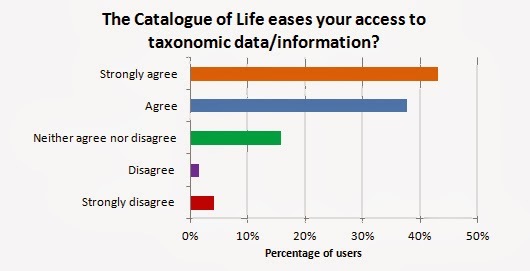 My database is of Phasmida [= Phasmatodea et al.] 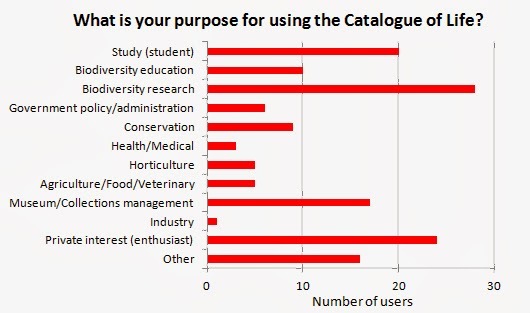 and includes 3058 valid species and a further 680 species synonyms. About 250 have common names, the rest do not have them. 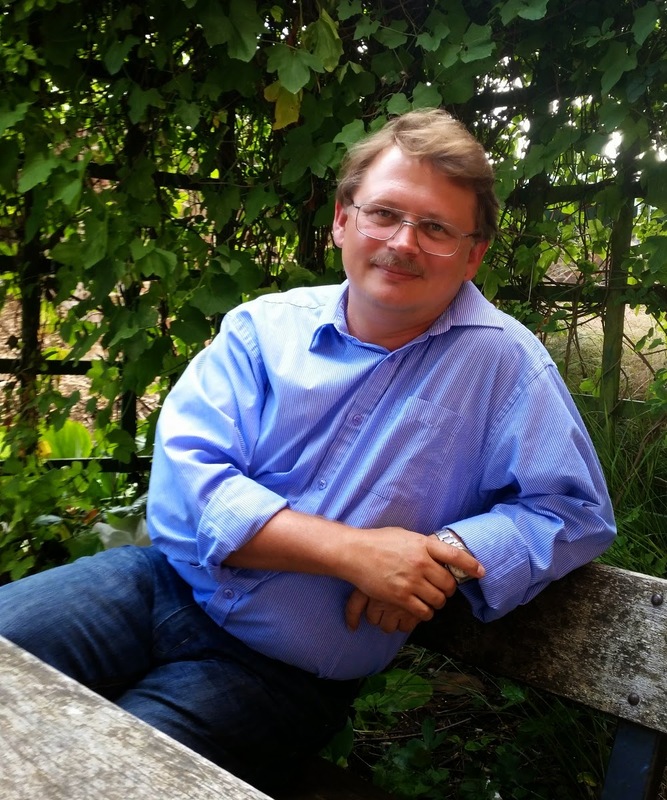 Although sad to see Yuri moving on after 15 years at University of Reading working on the Catalogue of Life I am pleased that he has the opportunity to continue his valuable editorial work from a new location, Champaign, Illinois. I look forward to continuing our collaboration and wish Yuri the very best in his new post working with David Eades. In the photo below Yuri is sitting outside Park House after a farewell lunch. Good luck and Bon Voyage! Yuri can continue to be contacted on his current email address for the next few months but will be getting new contact details in due course. 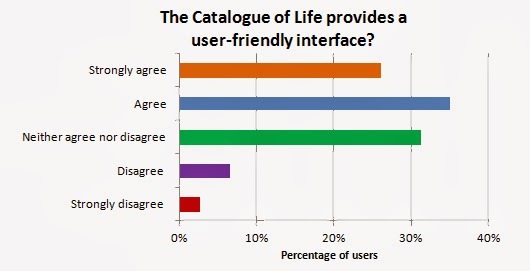 During July 2013 we conducted an online survey under the i4Life project to better understand our Catalogue of Life direct users and their needs. 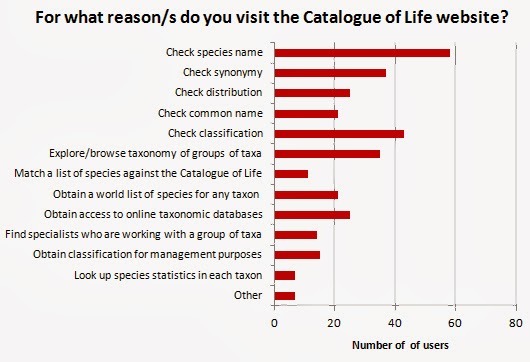 The Catalogue of Life is taxonomic infrastructure for many global biodiversity data providers who themselves service millions of users, but over a thousand people a day also access the online Catalogues direct from our website. 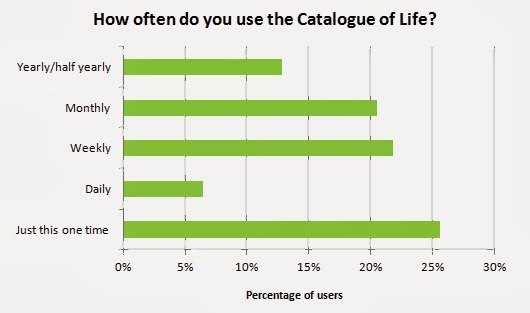 Google Analytics provides statistics on certain usage patterns, but we wanted to try to gain further insight. 78 people responded to our request for information (thank you!) 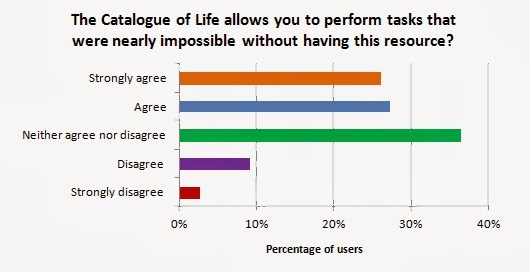 and below are the quantitative results from the survey. 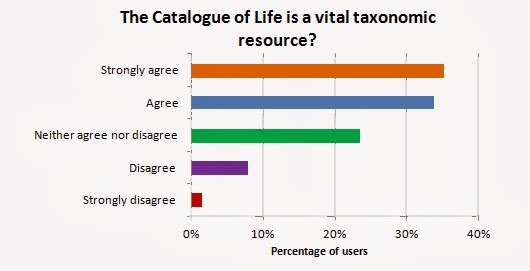 The majority of users, as we thought, come to the Catalogue of Life to check a species name. 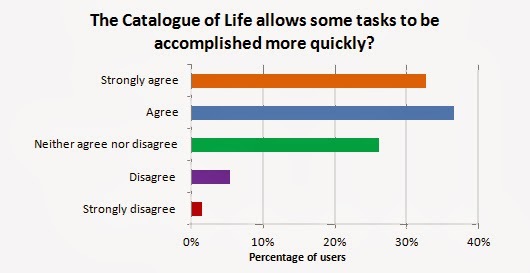 Many professionals are using the Catalogue of Life for their work. We have worked hard with our website to give clear explanations of our products but perhaps some of our users still do not understand the distinction between the Annual Checklist and the Dynamic Checklist. Stable name identifiers are the most important addition you would like to see. You really do consider us to be of help! 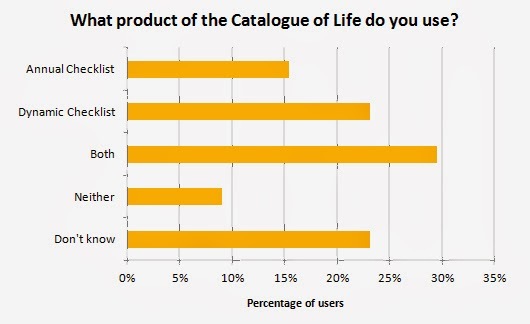 The Catalogue of Life, 20th January 2014 is now available online at www.catalogueoflife.org/col. The new edition includes updates of the World Ferns checklist that was incorporated into CoL last year as part of the i4Life project. Ferns are a very widespread linaege of plants often now considered to include the Horsetails (Equisetum) and the Whisk Fern (Psilotum). 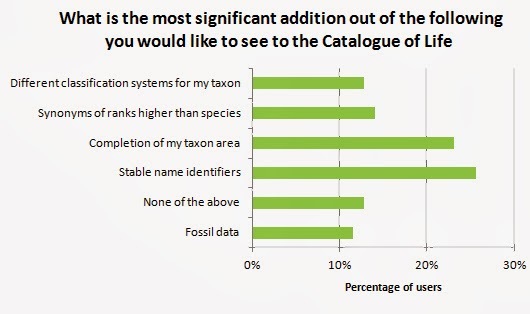 One of the largest fern genera is Asplenium which has >800 species listed in Catalogue of Life. Illustrated here is Asplenium ceterach which has distinctive rust-brown scales on the underside of its fronds. This has lead to the common name 'Rustyback fern'. Asplenium ceterach growing in a rock crevice in southern Spain.